Ok, so we all know how painfully slow this site is (not the speed Chris the traffic) and every once in a while edchainsaw or I (usually Eddie) tries to do something to get the troops rallied... usually unsuccessfully lol. Now is the time, if you haven't already thought about it, to lay out those plans for those winter projects! Let us all know what you are going to fix/paint/build or just think about doing and never get around to! I have so many projects that I want to do, I may never get them all done. First off, the 2-155 needs to get the motor pulled, something (my guess is the input shaft bearing) locked up in the over/under. Now it will only run if you keep your foot on the clutch pedal. The 1655 FWA has been sitting in the corner for about a year, but just about everything it needed in the mechanical area is done, so it is going to get a paint job. There's also that 1850 FWA (not mine) that needs to be finished up. I've got a couple of other projects, but I'll keep them a surprise for now. Well I'm about like Chris, I have so many I don't know where to start! I've got all the major parts except a flywheel rounded up for my Cummins/Oliver/White Hybrid. Looks like the flywheel will have to come from Cummins. I'm using a 2-150 rearend and O/U to eliminate the chain coupler. I really need to get that one going so I'll have another big tractor. I also have the 770 Industrial that needs finished put together so I'll have another loader tractor. And we're having a second SON due the first of April, so that's a whole different project! Look forward to hearing what everyone else has going on, WB<><. Congratulations John (and Cindy)! That sure beats any surprise I have. and then start hauling it off... I want to get an 88 working better so it can be sold (I will lose money I am sure) --- Dad's not an 88 fan at all. Got a 99 GM ready to go in the shop, to fix mechanically and paint will get some pictures of the progress, side projects a 550 diesel restoration and a little work on the 550 gas. Thanks Guys, We're excited about the addtion! I may get a hay crew after all, WB<><. Projects? Projects? I figured I would just concentrate on repairing equipment, the harrows, the 2 and 4 bottom plows, the potato planter, the potato digger, and hiller..... the list goes on. So yesterday I found the battery quite dead in the 1850 so got a new one but also found that there was a slow electrical leak drawing the battery down. Finally got it traced back to the Alternator.... that was no good,so had to go get another. That sits here on the kitchen table and will be todays project shortly. Yesterday, I also found that the hydraulic oil in the little 1255 was way overfilled.... turns out it had a lot of water in it so drained out and replaced all that. I cleaned the filter too. I have a water pump ordered for 2 weeks now for the 55 horse Kubota (yeah, I'll admit it.. I do have one), so have that to deal with when it arrives. Boy! I'll sure be glad to get all the tractors squared away so I can start on projects! Installing a woodburning furnace in the shop right now. Then project time. Two weeks ago, and two days before I left to have Thanksgiving with my Daughter and family in Virginia, my PC got a bug and needed a new hard drive....eeech...off to the nerds...er...geeks! The next morning my well quit! Whille in Va. the neighbor guys and my son installed a new submersible 4" pump for me! All's good with the world now!! I want to try to get my 1938 style 2 70 done. (only needs paint.) And I've got a 1958 770 that needs a clutch and a paint job. I should really fix the banging that's coming from the trans/rearend of the 1655 too. Keep putting that off and I'm afraid that I'll be baling uphill and a rear wheel will fall off! Need to get the clutch from Chris for the 720 baler and fix it up for next spring! But most of all, my goal is to live forever! And, so far so good! This is the oldest I've ever been! Hey W. B., congrats on the new heir to your fortune!! If the next one is as crazy about tractors as Isaac is, they'll take the tractors before I'm through using them! 'Tis truely a lofty goal to live forever.... I think I shall too! Well, that is if I can manage to keep all my innards. I lost a kidney to cancer back in May, but what the heck... I still got another! I am about to put an Oliver 4 bottom plow in the shop to repair. The plow must have been dropped on its nose, as the first share is twisted and the top beam is bent. Rather than try to straighten it I'm intending to make up another beam. This plow I hope to run on your old 1850. It still runs well, although I need to tinker with the AC. There were some old mirror mounts on it which I took off last week.... when I did there was a whoosh of air....????? Turns out one of the screws had punctured the AC hose which was Ok until I removed the screw It's all right... I like new projects. I was hoping I would see you at the Summer Oliver show in Pennsylvania. Did you make it out there? Weather is 22 degrees with a lot of wind so I have elected to work on the old house and run some lighting in the cellar. Funny, when it's haying time you wish for snow... right now I'd like some of that hayin' weather! Holy smokes Calvin, I'm sorry to hear that. I'll keep you in my prayers. Everything OK now, I hope? Yep, I was at the Penn. show and it was a good one! Sorry I missed you there too. I lost Audrey in July, so it was good for me to get out of the house. I spent a week and a half at my Daughters in Virginia Beach right after the show. Then three weeks later I hauled a trailer load of hay to her too. Then in october I spent six days in Ireland with my Son. Hard to work on AC in the middle of winter! Not much incentive is there. I am so sorry to hear about Audrey! My heart go out to you. I know she is missed. I am all "back together", or at least as much as I ever was I am home alone at the moment... Marilyn is in the Hosp. and had surgery yesterday for breast cancer, is doing fine. RATS! Her biggest concern is the ski time she might miss! She sure takes it all in stride! We probably passed eack other at the Penna. show and didn't even know it! that sure was an impressive show! Marilyn said the only way i was gonna go to their auction was with hands taped to my sides! I saw two little 440 Olivers that caught my eye. I am still waiting on the water pump for the kubota ... better than 6 weeks now. I suspect the dealer is in poor financial shape... never any customers when I am there... the place is cold... most of the lights are off. I just replaced the old warning lights on the 1850 with new LED lights. They are much brighter. I removed all the windows and cleaned up all the hinges so that the windows operate very smoothly now. Once spring comes around, I will replace the clutch in it. My intent is still to concentrate on implements this winter. Hope you have a great Christmas. Maybe Santa will bring you Oliver parts! One of the projects on my list is under way. The countershaft in my over/under in the 2-155 decided to give some teeth away. Parts are on the way. Let me just say, it does pay to shop around. Another winter project has arrived.... I have a 26 inch White (the make, not the color) snow thrower that was given to me. It works good, or it did right up until it sucked up the garden hose which was lying under 10 inches of snow! The front gear box casting on the auger cracked in two. The new part is over 200 bucks... what to do... I dont really need it as I have the 7 footer on the tractor. The White is only 3 years old with no time on it. Well, the hardest part to come to grips with is that when I had to tell my wife ..... she told me before the storm to pick up the hose and true to men, I grunted and declared it to be a non-problem where it was. (the new 100 foot hose is now two fifty footers) .......Winter projects. I figure I can keep in winter projects for a long time going as I do. Boy oh boy Cal, you hit the nail on the head!! Things just don't go as smooth now as they did 15 years ago. Seems like every project I step into hese days kind of gets stuck on my foot . The head says go ahead and do it....the rest says to take it easy for a while! aaahhh! But spring is coming! The seed catalogs are arriving! Note to Larry, tall fences are no longer a problem for me... i've started using the gate! I hope to see you at the summer show in Iowa. AH, to have heat in the shop... plenty to do when it warms up some. I got the oil leak fixed on our 1650 with a replacement front timing cover before it got cold. It started leaking at the axle seals while it was sitting, waiting to get that done. I didn't get to that yet. Now the 1800 has decided to leak at the axle seals. I swear parking them so close they must've touched tires and the 1650 spread its germs. Either that, or they are competing with eachother on which can make the biggest puddle. Good thing the 88 is at the back of the shop. I have the 88 to get running right. Its running on three cylinders. I'm guessing valves, but it'll probably need an overhaul. It also needs a clutch. I also have the 520 baler to figure out. Thought I had it but still have mis-ties on the left knotter. I'm going to pull the plunger to make sure the bearings and rollers it rides on are good. It maybe that I have to much top of plunger to frame clearance. The knotter itself is almost new except the worm gears that drive it. I want to replace those, and if I can find it the twine finger. The tip of the one for that knotter on mine is broken. The joy of owning old iron. Well, I guess this qualifies as a project. 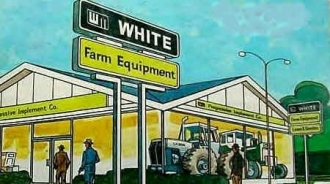 When I quit farming, I retained ownership of the 1955, but most of the other equipment stayed with the farm. The farm remained in the family and my father just passed away a month ago. My goal now is to retain as much of the land and machinery as possible. Most of the machinery will require a lot of work to get back into tip-top shape. Some of the machinery and land may have to go to settle with my sisters, but I intend to fully restore what I am able to keep. Any way you look at it there will be several winters worth of work for myself and my sons. Work which has to be wedged in between the time I am spending on the 400 sq. ft. living room we are adding on. Just finished the ceiling yesterday. Got the outside siding, the flooring (be a year before the hard maple cures enough to start that project) , the trim and molding, and finally the book shelf/entertainment center to go yet. The closer I get to retirement, the more project I seem to have!